The DVD has been re-released as a 2 disc DVD set! Gateway to the Superior is the story of the restoration of the DeTour Reef Light. It is told not only by the men and women of the DeTour Reef Lighthouse Preservation Society, but by those that actually carried out the work of the restoration. The 83-foot historic structure, located a mile off-shore on a concrete crib, warns ships of a dangerous reef at the entrance to DeTour Passage at the mouth of the St. Mary’s River which connects Lake Huron to Lake Superior. Restored by the DRLPS in 2004, it proudly sits between the two communities of DeTour Village and Drummond Island. The Light is an important part of the rich maritime history of the region. Fantastic footage is shown of the lighthouse before, during and after restoration, along with a fierce storm at the lighthouse in 1975. It includes interviews with the last known person who worked on building the lighthouse in 1931 and past keepers sharing their personal experiences at the lighthouse. Interviews of DRLPS members and state and federal historical preservation officials are also included. Video and photo-graphic memories recorded during three of our volunteer keeper weekends are on the DVD. Videographer Byron Goggin, of Wild Weekend TV was one of the keepers and the DRLPS is pleased to present his fascinating video of weekend lighthouse keeping on DeTour Reef. Slide shows by volunteer keepers Bob McSweeney and Gordon Snyder that record their experiences as Light Keeper are also part of the DVD. VISA, Mastercard and Discover are accepted. For additional information email memorabilia@drlps.com or call 906-493-6609. 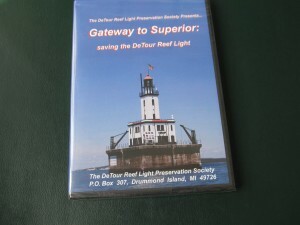 “Gateway to Superior – Saving the DeTour Reef Light” was produced by the DeTour Reef Light Preservation Society (DRLPS) and Ric Mixter of Airworthy Productions on the history and restoration of the DeTour Reef Light. Funding for this project was provided by Michigan Coastal Management Program, Michigan Department of Environmental Quality, and the National Oceanic and Atmospheric Administration, U.S. Department of Commerce, and matched by DRLPS volunteer services. All profits from the sale of this film go to the DRLPS, a nonprofit tax-exempt 501(c)(3) organization established in 1998, dedicated to preserving the historical, educational, cultural, and recreational value of the DeTour Reef Light.